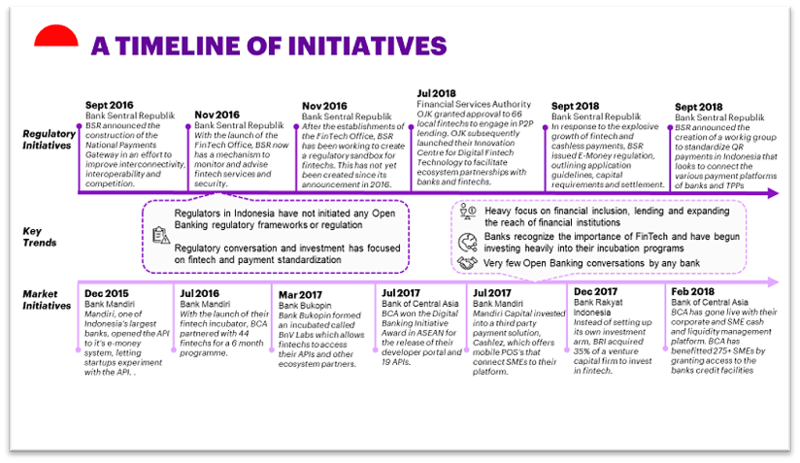 Authorities in Indonesia have not set any Open Banking frameworks or regulation, nor established any timelines for such initiatives, with most official discussions and investment focusing on encouraging fintech and payment standardization. Regulation is driven principally by the goal of improving financial inclusion for the large number of unbanked individuals in Indonesia. Though this drive has had some success, there is still a long way to go: Around half of Indonesia’s adults had a bank account in 2017, though this was up from just 20 percent in 2011, according to the World Bank. Against this background, regulatory bodies like the Bank Sentral Republik (BSR, the central bank) and the Financial Services Authority (Otoritas Jasa Keuangan or OJK) have recognized the role fintechs can play in financial inclusion and have launched numerous working groups to aid banking partnerships and standardisation. In November 2016 the BSR launched a Fintech Office, giving it a mechanism to monitor and advise fintechs, at the same time announcing plans for a regulatory sandbox (which has not yet been created). Regulators have also launched e-payment regulation aimed to facilitate fintech innovation. In 2016, for instance, the BSR announced the construction of the National Payments Gateway to improve interconnectivity, interoperability and competition. In response to the explosive growth of fintech and cashless payments, BSR issued e-money regulation, outlining application guidelines, capital requirements and settlement processes in September 2018. Also in September, BSR announced the creation of a working group to standardise QR payments in Indonesia, which looks to connect the various payment platforms of banks and TPPs. Meanwhile, in July 2018, the OJK granted approval to 66 local fintechs to engage in P2P lending. The OJK subsequently launched its Innovation Centre for Digital Financial Technology to facilitate ecosystem partnerships with banks and fintechs. Indonesia is ASEAN’s second-largest economy and is the country with the most unbanked individuals, presenting an incredible opportunity for banks and fintechs. Some are seizing the opportunity, with banks investing heavily into their fintech incubation programs. While, as yet, there are few conversations about Open Banking directly, there is a heavy focus on financial inclusion, lending and expanding the reach of financial institutions. State-owned Bank Mandiri has taken several initiatives. In 2015, it opened the API to its e-money system, giving startups the chance to experiment. In 2016, it set up a 500 billion rupiah (US$37 million) venture capital unit, Mandiri Capital Indonesia, to foster fintech startups, particularly those catering to smaller businesses1. Mandiri Capital runs a digital business incubator programme for fintechs in collaboration with Telkom Indigo2. In July 2017 Mandiri Capital invested in a third-party payment solution, Cashlez, which offers mobile point-of-sale systems that connect SMEs to their platform. Bank of Central Asia (BCA, the country’s largest private bank) set up a fintech fund in early 20173. In July that year, BCA won the Digital Banking Initiative Award in ASEAN for the release of their developer portal and 19 APIs. And in February 2018, BCA launched their corporate and SME cash and liquidity management platform, benefiting over 275 SMEs by granting access to the bank’s credit facilities. BCA also has a developer portal with several APIs. Meanwhile in March 2017 Bank Bukopin, which focuses on SMEs and the middle market, formed an incubator called BnV Labs, which allows fintechs to access their APIs and other ecosystem partners. And Bank Rakyat Indonesia, which also focuses on SMEs, acquired a 35 percent stake in a venture capital firm in December 2017, rather than setting up its own investment arm, to finance fintech startups. Payments has been a major focus of various initiatives: Banks have established partnerships with payment firms like Midtrans, Alipay and WeChat. Midtrans is an online payment system for SMEs and retailers that has enabled cost-effective transfers between all Indonesian banks. Midtrans’s other products—Iris, Aegis and Prism—reduce fraud, allow remittances and connect merchants. The risk remains that other payments giants like Paytm, WeChat and Alipay could yet disrupt Indonesian banks and fintechs. With so few developer portals, Indonesian banks still have an opportunity to leverage innovative ideas outside of payments, but run the risk that regional banks with established developer portals and partnerships could steal digital customer market share. As with other countries that lack regulation, API standardisation and adoption across the country will be difficult, and there will be uncertainty around when the authorities might decide to impose regulation. 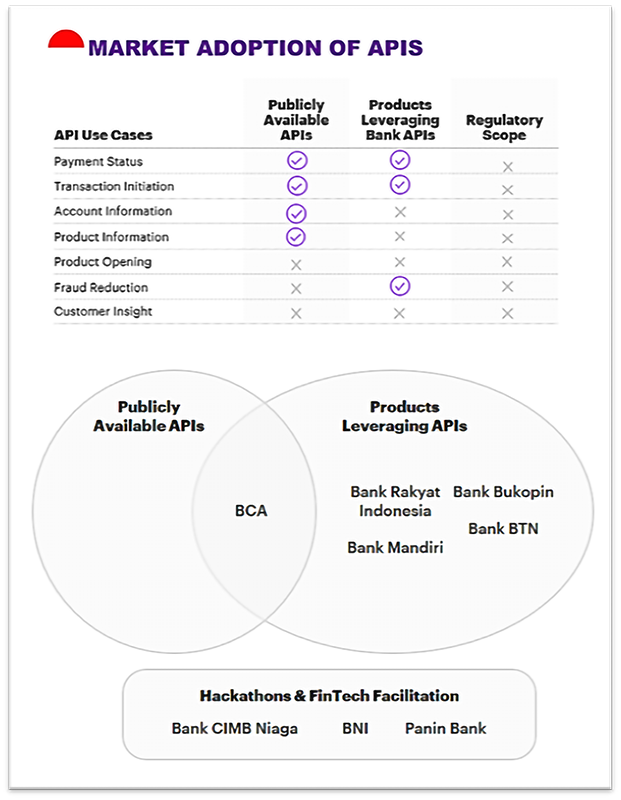 Indonesia’s banks have the opportunity to establish API standardisation before developing their capabilities. They should continue to partner with third-party providers to create ecosystems on which a broader range of innovative products can be developed. Further opportunities will present themselves to drive retail and SME customer adoption with additional services and to broaden financial inclusion.